We offer ceramic fiber insulation tapes that are fabricated using high quality ceramic fiber yarn and are reinforced with fiberglass filament & ss wire. 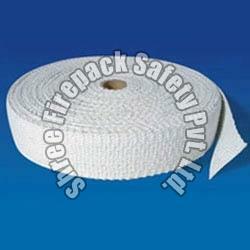 Indian ceramic insulation fabrics tape are woven in netted form made from ceramic yarn. Ceramic fiber insulation tapes are available in a variety of thickness from 3 - 6mm. The standard width of the cloth is 100cm. Custom widths are available against request. Ceramic fiber insulation tapes strips are available in width from 25-100mm. ceramic fiber insulation tapes are used for insulating covers or shields, cable or pipe wrapping, expansion joints, high temperature seals or gaskets. major usage: fire protection, pipe hanger insulation, insulation of industrial chimney, radiant heat shields, filtration media, electrical insulation, expansion joint, gaskets and wrapping material, laminates, gaskets and seals, boiler tadpole gaskets, welding and stress relieving curtains, lacing tape, cable insulation and protection against high temperature.